It was summer 2009 and I was a fresh economics graduate from the London School of Economics working at the Financial Times as an editorial intern. My final degree score averaged 69, one mark shy of a distinction. But after all the trials and tribulations of a challenging undergraduate course I was ecstatic to have come out of it alive, let alone with a merit. As I stood in the offices of one of the most famous and respected newspapers in the world, all around me the foundations of capitalism were falling to pieces. Banks were being bailed out with taxpayers’ money. Bankers were facing trial and evading prison. I was one of the lucky ones amongst my classmates who’d managed to get a job so soon after exams ended, but I still felt out of my depth at the FT offices, desperate to get a by-line and impress. I managed to publish over 40 in the three months I was there. Fast forward to 2018 and I’ve left the world of journalism far behind for the fast paced startup life of tech. I wake up at an airport hotel in San Francisco ready to fly to New York. 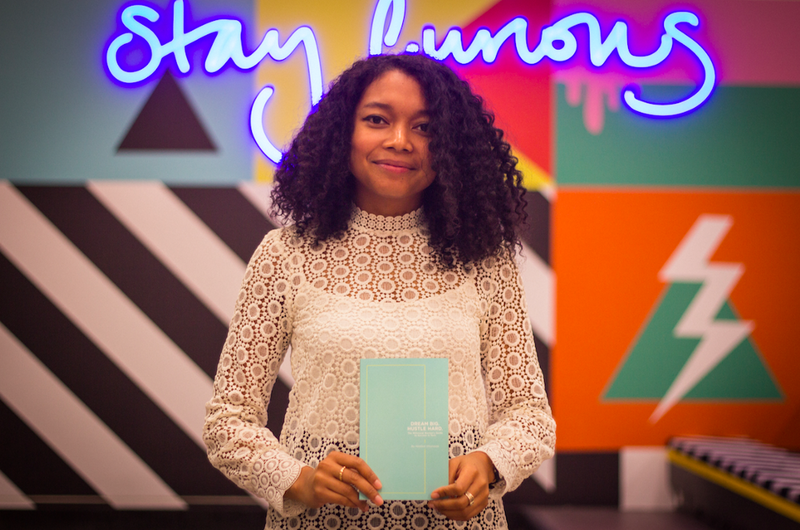 I’m two years into running my own company, Hustle Crew, and I’m delivering inclusion training to tech leaders. Not too unlike the invisible hand I learned about in lectures on the LSE campus, I must teach them about the invisible forces that have created a situation where teams are not diverse by default. Patriarchy, white supremacy, capitalism. I turn my phone off airplane mode to see messages from my Techish podcast co-host Michael Berhane. 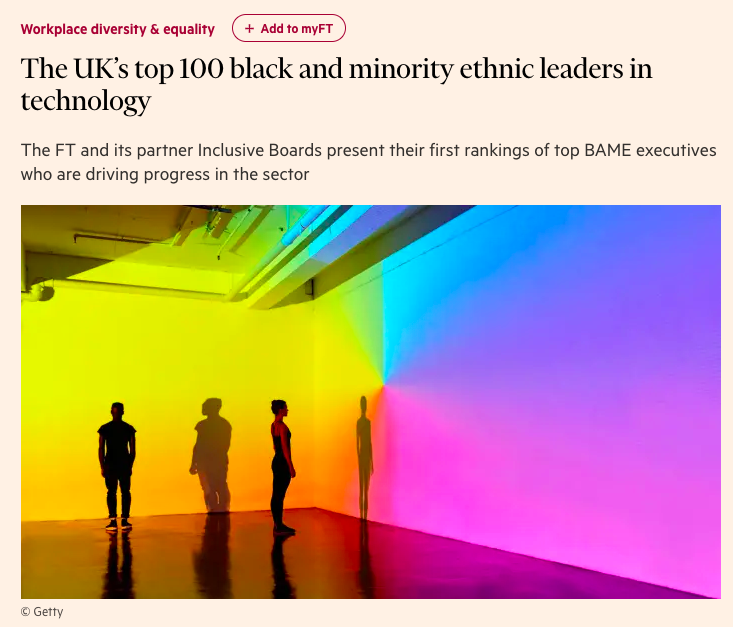 The FT have announced the Top 100 black and minority ethnic leaders in technology and I’m one of them. How did I arrive at this highlight? From editorial intern to editorial feature? Honored among exemplary professionals whose work I admire so much. I want to take a moment to reflect on some of the elements that could make this trajectory possible in the hope it will empower you to reach such great heights, too. 1. Diversity schemes and extra measures to support underestimated individuals are essential. 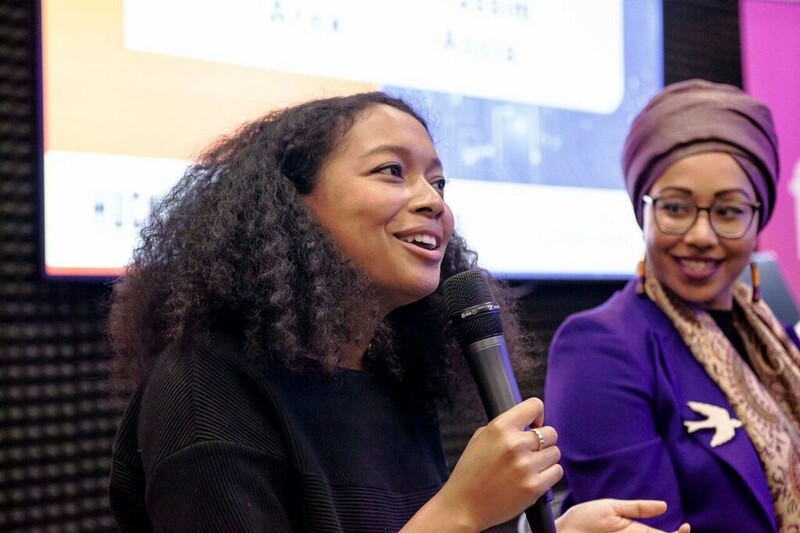 The reason I found myself as an FT intern in the first place was due to Pearson (who owned the FT at the time) running an annual Diversity Scheme for young people from black and minority ethnic backgrounds. I successfully applied after seeing this advertised on the LSE Careers website. The scheme made it easier for individuals from underrepresented races to find their way working in the FT office. I’m still friends with many of the people I met on that scheme. We supported each other and continue to do so today. It upsets me when organizations turn their noses up at initiatives like this. Diversity schemes change lives, I know because one changed mine. 2. Once you accept your career will be a long, winding path, it’s easier to keep moving forward. School and university is so linear it’s no surprise we find ourselves graduating expecting careers to follow a similar predictable and consistent path. For the first few years after university I felt a real anxiety around the lack of direction in my professional life. I recall going to a networking event aged 21 and hearing the speaker aged 30 say, “I graduated almost a decade ago and I love my job but I still don’t know what I want to do with my life.” My immediate reaction was a feeling of disgust, ‘How could you still be so clueless?’, I thought. The irony that I now share that speaker’s sentiment is not lost on me. Every disappointment and unplanned move in my career has led me to where I am now. I accept there will be further disappointments and unplanned moves ahead. I’m ready for them. 3. Proactively removing negativity from your life frees up energy and headspace to make progress. In my 20s I found myself investing time and energy in relationships that were certainly a net loss overall. A light bulb went off in my head as I started to read more personal development books, watch TED talks and explore the themes of psychology. I was not obligated to give my time to anyone. I had a choice about who I let into my life and who I let shape me. It’s not easy to walk away from people who society tells you that you should be close to, but we are each on our own journeys. We have one shot at life and owe it to ourselves alone to optimize for our personal motivations. No one else’s. This gets easier as you get older, when you can mindfully cultivate a support network based on your values. 4. Hard work is a skill we can all access, and you should never underestimate it. It’s impossible to reduce a lifetime of experiences into a replicable formula for success but if I challenge myself to think of a consistent element that’s featured in all my achievements it is this: hard work. In my school days I completed all my homework assignments meticulously so I could move on to the next task. I’d read ahead in text books so I was more prepared than my classmates and sometimes even the teacher. As the child of immigrant parents hard work is written into my DNA and it has never failed me. To prepare for university exams I packed a bag like I was going on an expedition except my destination was the library. I spent 12 hours a day, five days a week, in there. I anticipated the questions and timed myself writing essays like it was the real thing. I only walked out of one exam early in final year and it was also the only paper where I got a distinction (mic drop). Does that mean I have never failed? Of course not. But we don’t write about the failure stories. We write about the success stories. 5. Adjust your relationship with failure. Turn it into an essential type of spice that makes your life more interesting. If you’re not failing, what are you learning? If you’re not failing, how are you growing? If you’re not failing, where is the arc in your story? As I’ve mentioned in my book Dream Big Hustle Hard, fear of failure is not your friend. Don’t let it fool you. It’s a fake friend. It’s holding you back. I decided to accept failure as an essential ingredient for success when I took the risk to start Hustle Crew in 2016. I’ve not looked back since.